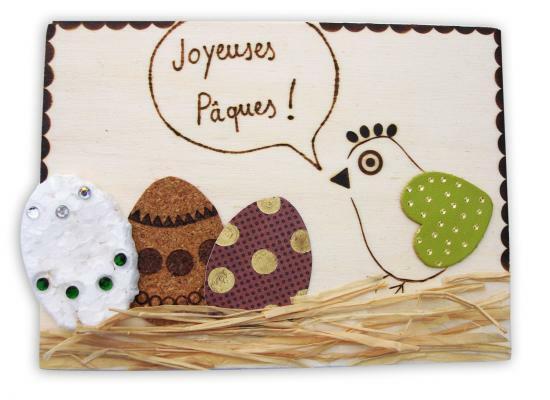 Easter is France’s second biggest family holiday after Christmas (the French don’t have the equivalent of Thanksgiving, instead celebrating le Toussaint (All Saints Day) at the end of October). Easter is much anticipated because schoolchildren have two weeks of holiday at this time of year (often spent with their grandparents, another French tradition). Everyone gathers on Easter weekend for the highlight: the family meal. So, what’s being served? Champagne and ‘amuse-bouches’ are often eaten first at the aperitif, while everyone gathers before sitting down at the table. As it’s springtime, asparagus is often served as a first course, perhaps with fresh chives. As eggs are often a theme, the usual vinaigrette might be thickened with just a bit of hard-boiled egg yolk–a subtle may to make the normally light dressing a little richer. A special Easter pâté might also be served; the traditional recipe is a square loaf of pâté baked with eggs inside, wrapped in puff pastry–which has a fun look when sliced. Lamb is typically served as the main course (another traditional dish is chevreau (baby goat), with broad beans as the traditional side dish. Salad and cheese are the third course. Typically, at a festive meal, there will be at least four cheeses to choose from: a blue cheese (like St Augur or Roquefort), a goat’s cheese (often with an ash-ripened covering), a semi-firm, drier cow’s milk cheese (like tomme, the classic from the French alps), and a softer, richer option (Camembert or Brie). Dessert is varied, but there is often a pound cake rich in eggs. 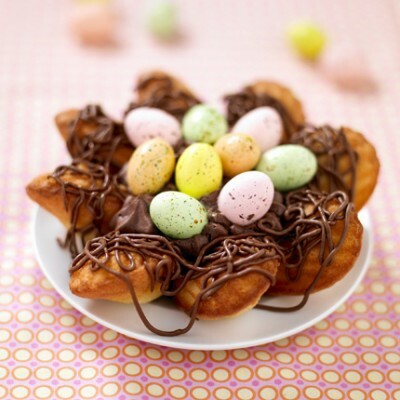 The French also often make an edible ‘Easter nest’, which is simultaneously a decoration and dessert–shaped in puff pastry in the form of a nest, and stuffed with edible chocolate eggs. A hit with the kids, it goes without saying. 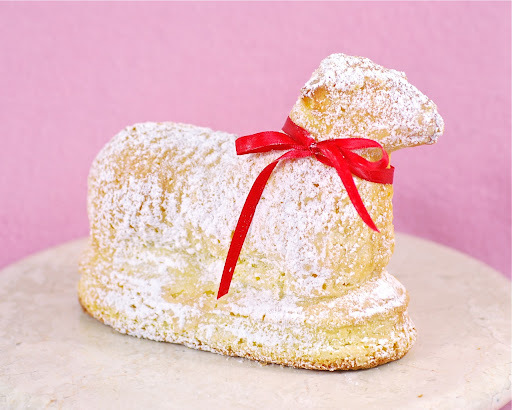 Each region will have its specialties too: the ‘lamala‘ (baby lamb) cake from Alsace, made in a special pottery cake mold only used at this time of year (it’s designed to stand up and look like a lamb, which it actually sort of does), or the ‘fouace’ bread (a sweet brioche somewhat like challah) from the south-west of France. Eating a meal like this usually takes a few hours; the French eat slowly, pausing between courses, telling stories, enjoying one another’s company. It took me a while to get used to when I first met my husband, but now I enjoy these long, leisurely meals at the table. By eating small portions, and eating slowly, the French enjoy each of the tastes on offer without feeling (or being) stuffed. The art of slow food, something I had to learn (but am glad I did). Happy Easter/Passover, and Bon Appétit! We’ve heard a lot lately about the dangers of snacking–but is it really such a bad idea? Some argue that regular snacking means that kids aren’t hungry enough to eat the nutritious foods served at mealtimes. Others argue that snacking has benefits (balancing out blood glucose levels, for example). I only let my kids have one snack a day. But before we moved, I let my kids snack several times a day. Whenever they said they were hungry, they got a snack (except in that half hour before mealtimes, and even then I sometimes gave in). However, I learned some things during our year in France that convinced me to change our family’s snacking habits. The first thing I learned is that French kids don’t snack randomly at home. They just never think of doing it. Astounding but true. I’ve been going back and forth between France and Vancouver for 10 years, staying for long periods with extended family and friends, and I have never once seen a child open the fridge or cupboard and dig around for a snack, or demand a snack from their parents in between mealtimes. Not once. I kid you not. The second thing I learned is that banning snacks is OK. If it’s a habit, and if everyone follows the same routine, it’s not a problem. French kids never complain about it, because it would never occur to them to eat at the ‘wrong’ time. Life goes on, and even without snacking their kids are just as well-behaved (or even more well-behaved) than ours. And they do just fine at school (even with much longer school days). There is one exception to the snacking rule, which is called the goûter. French kids DO eat after school. But it’s a mini-meal rather than a snack, eaten sitting at the table, with real foods – like bread and butter, fruit, yogurt. Then, French kids don’t eat anything until the evening meal at 7:30 or 8 pm. No bedtime snack. The result? You guessed it: French kids eat much better at mealtimes, because they feel hungry. And the foods at meals tend to be more nutritious. So their diets are healthier. The French approach at school is also interesting. French kids can’t snack at school, even if they wanted to. They are not allowed to bring food from home, and there are no vending machines (they’re completely banned in all schools). Most French kids don’t even want to snack, because the lunchtime meal they’re offered is so tasty. As the menus on my French Kids School Lunch Project blog suggest, French kids’ school lunches are tasty, nutritious, and highly filling. They eat a lot of foods high on the ‘satiety index’ at lunch, because the expectation is that lunch is the biggest meal of the day. No snacks!? This might seem shocking to North American parents. What if my child is hungry? I used to think. Should you really deny you child a snack, even if they say they’re hungry? That’s so controversial, to say the least. Here’s my view, based on what I learned in France–but also based on commonsense. There is a difference between feeling hungry and being hungry. No one wants a child to BE hungry. But the French think it’s OK to FEEL hungry. What does that mean? It means being comfortable if your stomach is empty, and being able to wait until your next mealtime–even if you do feel hungry. Otherwise, the French believe, you create a culture of ‘unregulated eating’….with all of the health problems that arise from that. And I think that we see the signs of this all around us here in North America. No culture is perfect, and there are lots of things I wouldn’t want to adopt from France, but I do think they have some great ideas about how to feed children–ideas we could definitely learn from. I know this might sound cruel! But read on for my explanation of why I think the ‘no snacking’ approach is positive — both for what children eat, and how they eat. We’ve heard a lot lately about the dangers of snacking–and it is a hotly debated topic. I only let my kids have one snack a day. But before we moved to France, I let my kids snack several times a day. Whenever they said they were hungry, they got a snack (except in that half hour before mealtimes, and even then I sometimes gave in). However, I learned some things during our year in France that convinced me to change our family’s snacking habits. The first thing I learned is that most French kids don’t snack randomly at home. They just never think of doing it. Astounding but true. I’ve been going back and forth between France and Vancouver for 10 years, staying for long periods with extended family and friends, and I have never once seen a child open the fridge or cupboard and dig around for a snack, or demand a snack from their parents in between mealtimes. Not once. I kid you not. The second thing I learned is that scheduling snacks is OK. If it’s a habit, and if everyone follows the same routine, it’s not a problem. French kids never complain about it, because it would never occur to them to eat at the ‘wrong’ time. Life goes on, and even without snacking their kids are just as well-behaved (or even more well-behaved) than ours. And they do just fine at school (even with much longer school days). No snacks!? This might seem shocking to some parents. In some American schools, snacks are served to all children (on the theory that they need good nutrition, so that hunger doesn’t interfere with learning — which is true, particularly for lower-income kids, but perhaps not necessarily needed for all children). Not snacking is also a difficult concept if you don’t like the idea of your child being hungry. What if my child is hungry? I used to think. Should you really deny you child a snack, even if they say they’re hungry? That’s controversial, to say the least. Here’s the French view: there is a difference between feeling hungry and being hungry. No one wants a child to BE hungry. But the French think it’s OK to FEEL hungry. What does that mean? It means being comfortable if your stomach is empty, and being able to wait until your next mealtime–even if you do feel hungry. Otherwise, the French believe, you create a culture of ‘unregulated eating’….with all of the health problems that arise from that. To prove their point, they might refer to the statistics which show that American children snack, on average, three times per day (and one in five snack up to five times per day). Although I didn’t agree with their view when we first moved to France, I’m now convinced. That’s why I no longer let my kids snack more than once per day. No culture is perfect, and there are lots of things I wouldn’t want to adopt from France, but I do think the French have a good approach to snacking. What do you think? France’s new tax on soda pop: Should we tax ‘bad’ foods? Earlier this week, the French government passed a new law introducing a tax on sugar-sweetened drinks which will apply to soft drinks (both sugar and diet) and sweetened juices. Public health campaigners are delighted. But the tax–a minimal 1 cent per container–has been criticized as ‘discriminatory’ by manufacturers, who have threatened to increase prices significantly (some newspaper articles talk of 20 to 30% rises) to offset lost profits. France joins a number of other European countries (Denmark, Hungary) which have implemented so-called ‘sin taxes’ or ‘fat taxes’ over the past few years. Critics argue that the low levels of such taxes won’t deter necessarily consumption. But they will bring in a lot of revenue: an estimated $150 million for the French government–which will be welcome in the current economic climate. In the US, the debate over ‘fat taxes’ heated up in the 1990s following a New York Times op-ed by Kelly D. Brownell (director of the Rudd Center for Food Policy and Obesity at Yale). He argued that the lower cost of unhealthy food creates an incentive to consume it: more calories for your buck. Other food writers like Michael Pollan have gone further and argued that government subsidies (notably via the Farm Bill) keep the prices of unhealthy food artificially low. But proponents of ‘personal responsibility’, from Sarah Pailin to Rush Limbaugh, have argued against government meddling in food choices (and personal decisions of any kind). The French see it differently. They feel that a healthy food system and healthy eating depend on both personal responsibility and on social responsibility–supported by government regulation as appropriate. In my opinion, and as I’ve blogged on my French Kids Lunch Project, this has resulted in better nutrition for children–both at home and in schools. What do you think? Is taxing soda the right thing to do? Is better food a question of personal responsibility, or social responsibility, or both? France's new tax on soda pop: Should we tax 'bad' foods? One of my favorite books on kid’s food is Laurie David’s The Family Dinner: Great ways to connect with your kids, one meal at a time. Full of simple strategies for making mealtimes more enjoyable, Laurie makes a key point that is often overlooked in the kid’s food debate: how we eat is as important as what we eat. As I realized after our family moved to France, Americans spend the least time of any country in the developed world on cooking (30 minutes per day, whereas the French spend, on average, 48 minutes). But the real difference is in how much time we spend eating: less than an hour per day for Americans (and well over two hours per day for the French). What’s the point of spending all of that time at the table, you’re probably wondering? Well, research shows that people who eat alone tend to eat more overall, and also tend to eat poorer quality food. Research also shows that children are more likely to try new foods if their parents are sitting with them, and try them too (the ‘do as I do, not as I say’ effect!). So we know that children will eat better if they eat with other people. But Laurie David’s book captures another important issue, that is more rarely discussed. Children’s emotional relationship to food (which is so central to healthy eating when they become adults) is fostered at the table in interaction with other adults. If the family table is a serene haven in a busy day, then a positive relationship is fostered. Admittedly, with two very busy children (3 and 7), the table doesn’t feel very peaceful all of the time. But I’ve found that conversation is absolutely critical to capturing my daughters’ interest, and keeping them at the table. One of my earlier tactics was to make up stories, but I soon ran out of repertoire. Here’s where Laurie’s book was helpful: it has lots of great suggestions for conversation starters, games, and other tips and tricks for keeping children interested and happy at the table. Many of these ideas are commonly used by French families, by the way. Is it hard to make time in our busy lives for eating together? Definitely! Both my husband and I work full time, and we don’t have any help at home. Cooking when we get home from work is always a scramble. But despite this I’ve taken Laurie David’s message to heart, and we’ve cut back on kid’s after-school activities, in order to make sure we eat together as a family most nights of the week. So thanks, Laurie, for an inspirational book! Nestled in the foothills of the southern French Alps, Grenoble (population 150,000) is known as the “Capital of the Alps”. Palaces, museums, and a lovely ‘old quarter’ attest to its long history as a Roman town, and as the crossroads between France and Italy for centuries. Today, Grenoble is a university town, an international scientific centre, and a city for outdoor lovers. So, what are French children eating in Grenoble this week? It’s easy to find out, because all over France the menus are posted online for parents to see. This week’s menu (titled “I am improving my eating habits”) actually has 4 courses (although some would be served at the same time): Entrée (starter), Plat (main dish) and Garniture (side dish), Fromage (cheese), and Dessert. How much do families pay for this? On a sliding scale (according to family income), the lowest price is $1, and the highest price–for the wealthiest families–is $7 (similar to prices in Paris). Most families pay around $3 per meal. How much would you be willing to pay for meals like these?